Bloomberg Businessweek has a global circulation of over 980,000 and has readers in 150 countries. It is a trusted news source for decision makers across the world and an influential leader of business and financial information. Being ranked Top 50 on their annual MBA College Ranking list allows global exposure for the school. When Bloomberg Businessweek notified the University of Cincinnati's Lindner College of Business that at least 25 percent of their alumni needed to respond to the publication's online survey in order for the school to be considered for the list, the college knew it had to take action. Their inclusion was vital in order to maintain the increased quantity and quality of MBA applicants they had seen since first making the list, and they decided to partner with FUSIONWRX to activate a strategic campaign to encourage alumni to complete the survey, support the college of business and maintain their ranking. Inform alumni of the survey and ultimately achieve at least a 25 percent response rate in order to qualify the Lindner College of Business for inclusion on the MBA College Ranking list with the goal to rank UC College of Business as one of the TOP business schools in the nation. 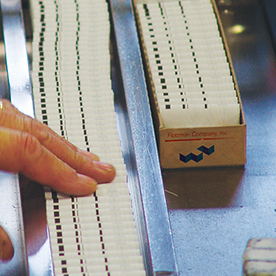 Direct mail pieces played an integral role in this campaign. Partner with UC's in-house design team to develop a multi-channel awareness campaign that tied in with the college's current marketing designs. Use personalized marketing components to grab recipients' attention and ensure they receive the information. Use facts and statistics about the college's success to remind alumni of the benefits of the program. Generate excitement and pride among alumni so they feel compelled to complete the survey and support their school. 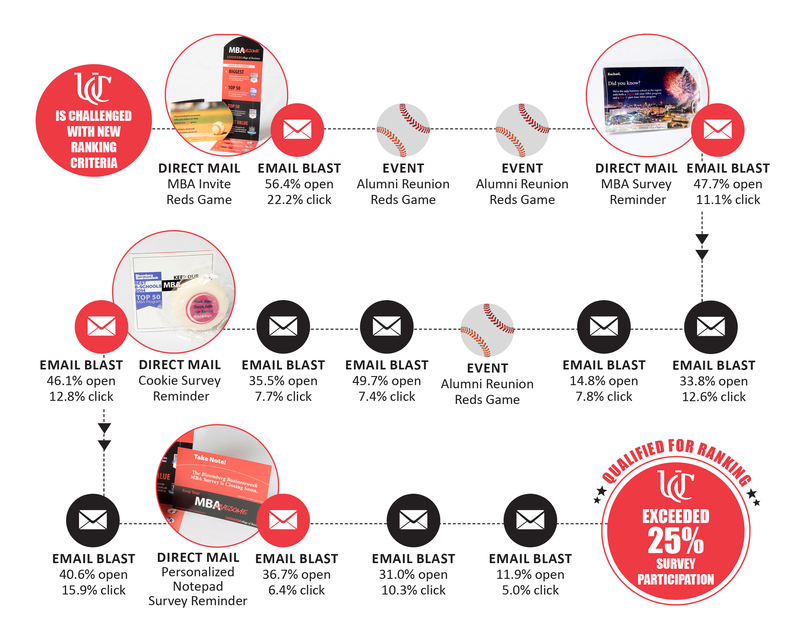 The five-month campaign consisted of four personalized direct mail pieces, eleven personalized emails and three UC-hosted events. Each mailer was designed to grab the attention of the recipient and to intrigue them so they would want to open it. They were all accompanied by email blasts, with additional emails staggered throughout the campaign. 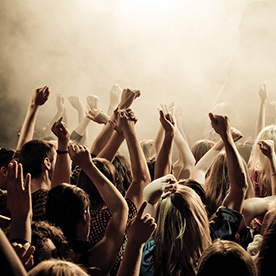 This layered marketing approach enabled support for the campaign to grow. 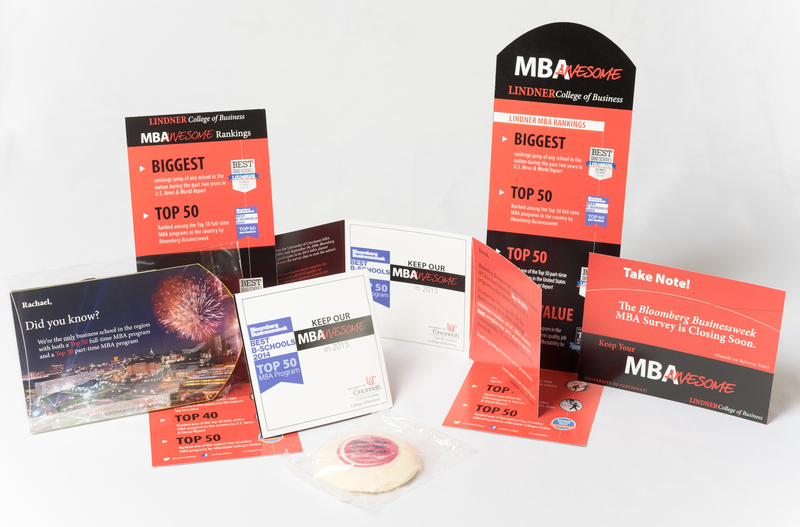 The design pieces utilized the tagline "Keep your MBA Awesome" to emphasize the quality of program and to show alumni that they had the power to influence the future of the program. The copywriting of the campaign zeroed in on the need to participate and the benefit to UC as well as raising the profile of former graduates. The first personalized direct mail piece that was sent was a die-cut mailer that included an invitation for recipients to attend a free Cincinnati Reds game with their fellow alumni, along with information about the college's current high rankings. It was sent in a clear envelope to offer a view of what was inside. We recommended this mailing method to ensure pieces would make a splash in the mailbox. Alumni that attended the games were given information during the event about the survey for Bloomberg Businessweek and encouraged to complete it. The second mailer had the same design format, but the contents focused more on introducing the survey, with an emphasis on the UC experience and the quality of their MBA program. It was also sent in a clear envelope. This mailer was first class individually stamped to add uniqueness to the piece. 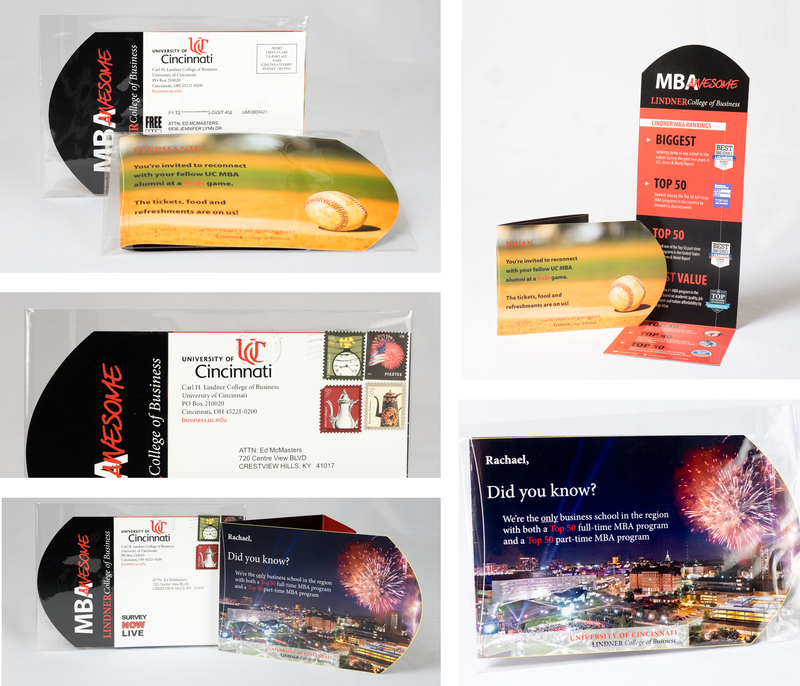 The first and second direct mail pieces that were sent to invite alumni to a Reds game and to encourage them to complete the survey. The third mailer was sent in a 1" x 4" x 4" personalized white craft box branded with the UC Lindner College of Business logo. The box contained an informational card explaining the need for alumni to complete the survey, along with a branded Busken cookie with the message, "Sink Your Teeth Into Our Sweet Rankings." As a local bakery with a high profile on UC's campus, the Busken cookies were able to establish a connection with alumni. The third direct mail piece included an infographic of the college's successes, a note about completing the survey and a branded Busken cookie. The fourth mailer was sent in a bright red envelope and served as a final reminder to complete the survey. It included a personalized note with the heading "Take Note" to remind alumni of the survey's upcoming deadline. Additionally, the mailer included a personalized note pad with the recipient's name that was also branded with the logo for Bloomberg Businessweek's list of top 50 MBA programs. The fourth direct mail piece consisted of a personalized note pad with the UC College of Business logo and a card reminding recipients of the survey's upcoming deadline. They were sent in a bright red envelope to demand the attention of the recipients. • Emails that accompanied direct mail pieces had a 46.7 percent open rate and a 13.1 percent click rate. 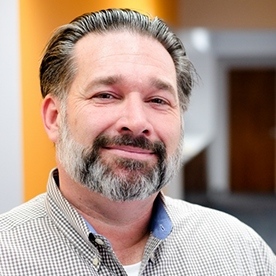 • The email blasts in total received a 36.7 percent open rate and a 10.83 percent click rate. • The number of completed surveys increased after the delivery of each direct mail piece. • 26.5 percent of full-time alumni and 31.2 percent of part-time alumni completed the survey, surpassing the national average of 25.1 percent for full-time and 27.2 percent for part-time. • UC was one of the first universities in the country to surpass the necessary 25 percent completion rate and finished with one of the top response percentages. • After achieving the ranking for both the full-time and part-time MBA Programs, UC saw an increase in the average GMAT score of its incoming class, signifying an increase in quality applicants, raising the scores of the incoming class to the highest in the history of the school. The campaign has also increased brand awareness for the college with placements in multiple magazines, competition and web content, opening UC to a diverse audience of more than just potential students. Overall, the Lindner College of Business surpassed its goal for survey completion and was able to maintain its ranking on Bloomberg Businessweek's list, which in turn led to more and higher quality applicants to the program. The campaign was a Grand Award Winner in Print Solutions magazine's annual PEAK Awards for Best Cross-Media Marketing Campaign for a Client. The magazine included a write-up on the campaign in the edition announcing the award winners. The PEAK Awards program recognizes excellence in marketing services and print by promoting projects that display innovation and quality and deliver a high return on investment. 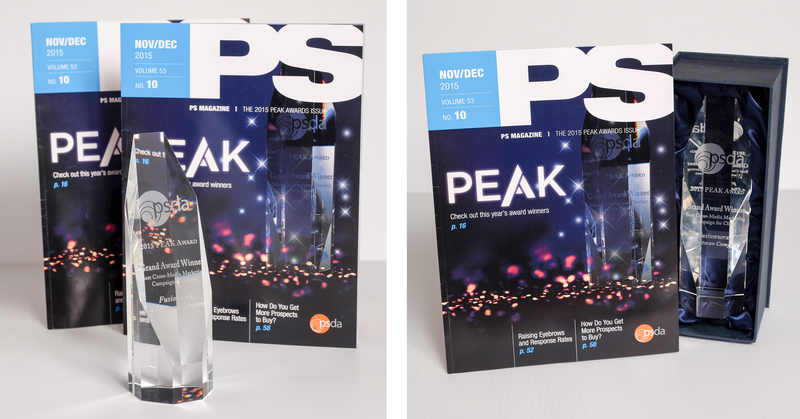 The campaign won a PEAK Award for Best Cross-Media Marketing Campaign for a Client.